A bold Julia Gillard made an unapologetic stab at the current prime minister, when she stated that Abbott’s good ideas are such a rarity that they should be written down. ‘Tony Abbott had a good idea, so we should write down the date,’ she said to an amused audience at a Photo Opp Event. Former New South Wales Premier, Kristina Keneally and Julian Morrow from the successful comedy group, The Chaser, hosted the event, inviting former politicians to discuss the background of famous photographs from their political careers. Gillard’s witty statement came about after she was questioned on a legendary photo containing herself and all the living Australian prime ministers. She said the photograph was one of the only significant ideas Abbott has ever had, after he persuaded the former leaders to line up for the photo at Gough Whitlam’s Memorial event. ‘The idea was to get all the prime ministers in one spot to get a photo and so as we all moved on from the funeral, Tony was there saying “we should get a photo, we should get a photo”…My main thing is I would’ve preferred not to be standing next to Tony … and you will note Bob [Hawke] took the hit for the team,’ Gillard said during the event, making her dislike of the current prime minister apparent. At the same memorial, Gillard was criticized for the awkward moments between herself and former ally, Kevin Rudd, due to her alleged refusal to be seated next to him. She has since denied these claims, saying that the seating reorganization took place because there were too many people. Gillard, along with all the former Labor leaders, received a large applause upon entering the memorial, except for Rudd who received only a polite clap from the audience and Abbott was booed. During the conversation with Keneally and Morrow, Gillard’s humorous remark against Abbott was followed by her admission that she finds Barack Obama attractive. 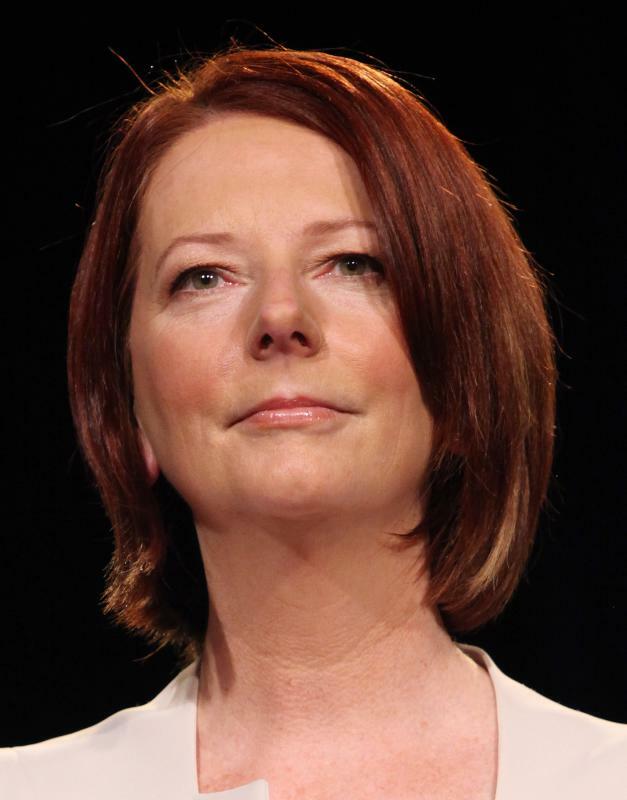 ‘Very!’ Gillard responded, showing a personal and relaxed side to the former leader. Hillary Clinton has previously applauded Gillard’s bravery in a male dominated profession, where she deals with blokes like Tony Abbott who makes statements such as ‘what the housewives of Australia need to understand as they do the ironing …’ or explaining that a woman’s virginity is the greatest gift she can give her husband. ‘…it’s an unfortunate reality that women in public life still face an unfair double standard. Even leaders like former Prime Minister Julia Gillard of Australia have faced outrageous sexism, which shouldn’t be tolerated in any country,’ Clinton wrote. Following Gillard’s powerful misogyny speech in 2012, where she slammed Abbott for having ‘repulsive double standards when it comes to misogyny and sexism,’ her latest statements at the Photo Opp Event demonstrate the importance of her presence within the Australian government as a spokesperson against sexism. This can be seen in her autobiography, My Story, which stands as a powerful recount of her time as prime minister.